We have know it was coming for a while, but today Valve put out a cute little video of Big Picture, their solution for playing Steam titles on your TV. If you needed a reason to build that ultra tiny HTPC, this might be the straw that breaks it. 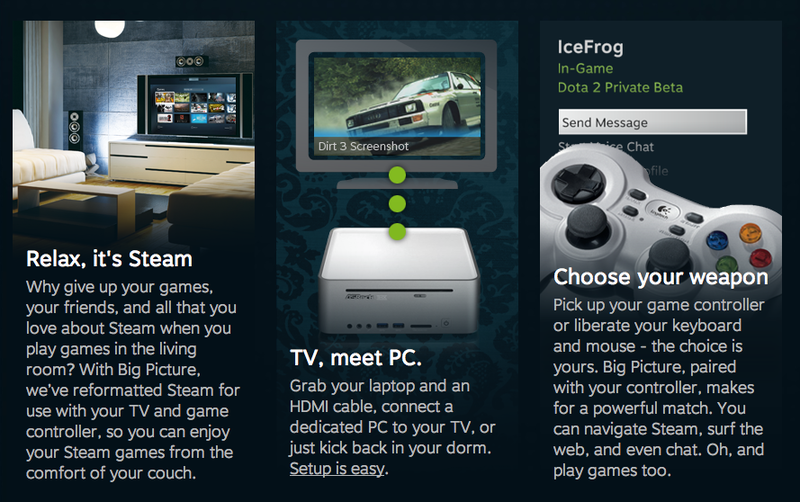 According to the video, Big Picture is simply an interface that allows you to easily manage your Steam games on your TV. 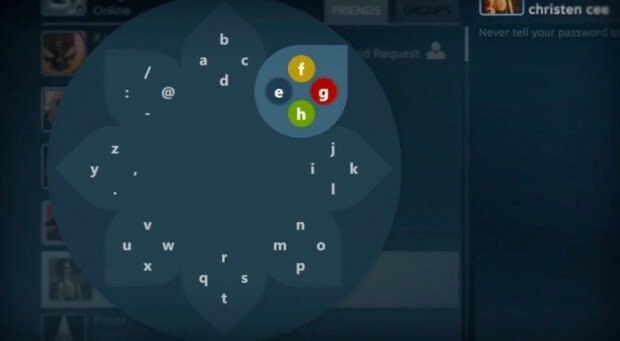 Text and icons will appear larger and more easy to read from your favorite spot on the couch, and you have the choice of using a controller or keyboard/mouse. The interface has been tooled to accept controllers (although the games certainly will vary), and you can even input text with an interesting looking radial dial called Daisywheel. And why would you be inputting so much text? Because there is a new web browser, of course. Touted as the “world’s first first person web browser,” the software uses “reticle-based navigation” to mouse around pages. Other than the brief glimpse of it in the video, that’s all we know so far. If Big Picture works well as intended, consoles might finally have some big competition in the living room, and obviously that is Valve’s goal. Why buy into the next generation of consoles when you can just use your already existing PC (that is easily upgradeable) to play everything that is coming down the road? This will be very interesting indeed. Check out Big Picture, Steam’s new mode that lets gamers access all of their favorite Steam games on a television. With the press of a button, Steam displays a new full-screen user interface optimized for readability and interaction on TV. Big Picture has been designed to be used with a traditional game controller, while also fully supporting keyboard and mouse input. Big Picture is coming out in beta today for PC (Mac sometime later, BOO), so get ready. For now, read up on the deets right here.